your eyes has to be a top priority. Safety glasses are your first steps. Naturally, eyewear that is specifically designed for your work can help to keep you safer. But that’s not where it ends. Don’t assume that simply because you buy safety eyewear, your job is done. Instead, you need to find eyewear that you know to be of high quality. Too often, you don’t find out that a product you choose doesn’t hold its promise only when it fails. When that happens to your glasses, you could sustain serious injury. That’s why, when it comes to prescription safety glasses, you need third-party proof. You need to make sure that the glasses you buy fulfills is promise, before you ever try them on. That’s where OSHA approval comes into play. First, and especially if you are not used to safety equipment, you might wonder about the meaning and importance behind OSHA to begin with. The term is short for Occupational Safety and Health Administration, which is the part of the U.S. Department of Labor that ensures workplace safety in a variety of contexts. Naturally, that context includes safety equipment, including eyewear. OSHA has published a large number of standards specifically designed to improve safety in the workplace. Some employers, especially those who have contracts with the government, have to follow all regulations. For others, some of the standards are only suggestions. Either way, following OSHA regulations and recommendations matters. It helps you better understand exactly what type of eyewear will actually keep your eyes safe. The requirements beyond that basic minimum only add to that overarching goal, looking to standardize safety requirements across industries and throughout the country. The standards OSHA follows in regards to eyewear don’t actually come directly from the industry. Instead, they are adopted from the American National Standards Institute (ANSI), a national non-profit organization dedicated to safety standards for a variety of industries. Finding OSHA-approved prescription safety glasses means understanding these ANSI standards. The exact standards are complex, and differ depending on use. 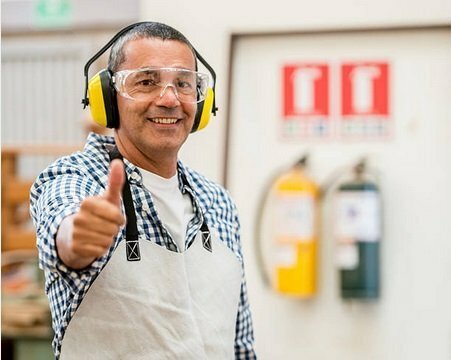 OSHA has an entire section of its website dedicated to protective eyewear. Tips here include anything from recommended protective shade to lens thickness. 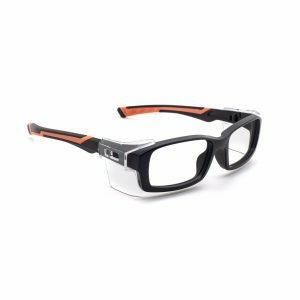 Going through this portion of the website can help you better understand exactly what your intended use requires in terms of safety glasses. Beyond that, every OSHA-approved pair of glasses needs to have its ANSI status clearly marked on the lens. The agency currently uses the Z87.1-2010, although some eyewear still on the market may still carry the older Z87.1-2003 standard. Both are similar, but one is the more recent and accurate mark. According to the current Z87.1-2010 standard, safety glasses must carry the manufacturer’s marking, followed by a “+” sign if the lenses are Impact Rated. For example, if the safety glasses are made by 3M and are Impact Rated, the lenses must be marked “3M+”. If the safety lenses are not rated for impact (in other words, they are designed only for protection from chemical splashes, etc. ), the marking would simply be “3M”. Look for this mark on the upper, outer corner of the lens. When you find glasses that match this standard, you can feel better knowing that you don’t have to understand every single detail that goes into it. Instead, you know that the eyewear will be safe for use. 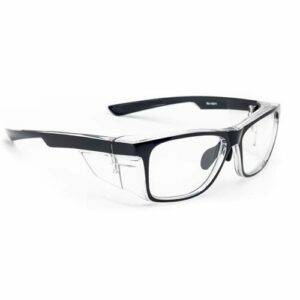 Combine that with the general classification info linked on OSHA’s website, and you get everything you need to find perfectly safe prescription safety eyewear. While all of the above is undeniably true, you still have to be cautious in the shopping process. That’s because you might not realize that your lenses and frames both have to match the standards set by ANSI and enforced by OSHA. Approved lenses matter little if the frame that holds them cannot hold up to the job, and vice versa. In most cases, that’s likely not a significant issue. 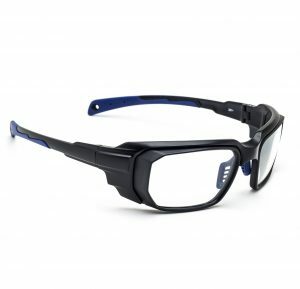 You can simply find eyewear that has the ANSI standard mentioned above, with both frame and lens included in the deal. That is not true, however, if you have to switch out lenses or get a new frame. In that case, looking for the seal of approval has to be part of your consideration process. Fortunately, that’s relatively simple once you know what to look for. Just like lenses, frames have to include a mark that describes exactly what standards they follow. If the frame you choose does not have that mark, you might want to look for an alternative. After all, safety is key in this type of shopping process. Another important consideration is the fact that you don’t have to go with the bare minimum. Rest assured that ANSI standards and OSHA-approved glasses will likely do the job. But if you can add safety beyond the basics, why wouldn’t you? After all, you probably and rightfully put a priority on keeping your eyes safe even as you have to see clearly. Consider your lens material as an example. 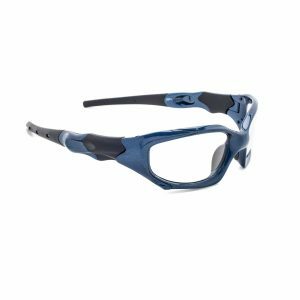 Chances are that you can find plenty of safety eyewear that meets ANSI standards with relatively basic material. Simple plastic lenses cost less, and might seem like a good investment at first as long as they are approved by OSHA. But reality might look different. Polycarbonate lenses, for instance, offer significantly more shatter resistance without adding any weight to your eyewear. They will cost more, but help to ensure that your eyes are even safer than they would otherwise be. A number of other options have similar benefits and effects. The key, then, is making sure that you don’t consider OSHA approval as the golden standard for your prescription safety glasses. Instead, consider it a minimum requirement. If you have the money, going with more than the cheapest option helps you make sure that your eyes always remain safe and you never have to worry about failure. Similar to the above point, you should also be sure that the glasses you pick actually meet the requirements of your actual jobs or tasks. OSHA has created a number of categories, from welding to glass working, but yours might not fit neatly into that. While the standards remain an important figure to follow, they should not be your only consideration. Instead, look for more specific examples in your industry. Do some preliminary research, including industry leaders who accomplish similar tasks. And of course, a simple online search may help you find exactly what you are looking for. The goal in each of these steps is the same: to make the eyewear you want to buy more relevant to the actual task you want to accomplish. That holds true, whether you need safety glasses for professional or recreational purposes. It also means expanding your search beyond OSHA approval. For example, would wraparound frames or goggles make more sense in your situation than regular eyewear? If they do, now is the time to find out and adjust accordingly. All of the above are undoubtedly crucial consideration. ANSI standards should be the bare minimum, for both your lenses and your frames. It makes sense to go beyond these minimum, as your budget allows and as is appropriate for your intended use. Only after these steps should you actually make a purchasing decision. To get there, of course, you need to know where to look. Storefront merchants often have a limited selection that might not meet your needs. Online alternatives tend to be better in the amount of selections and options they offer. But of course, in that case, you have to make sure that the store you buy from is credible, and actually offers eyewear according to OSHA standards. That might sound complicated. And often, it is. But the added effort will be absolutely crucial if you want to make sure that your eyes are actually safe. Few parts of your body are more sensitive, and eyes are often exposed to the most dangerous conditions because we have to see clearly. That fact makes doing the additional research crucial in protecting yourself or anyone you’re buying safety equipment for.